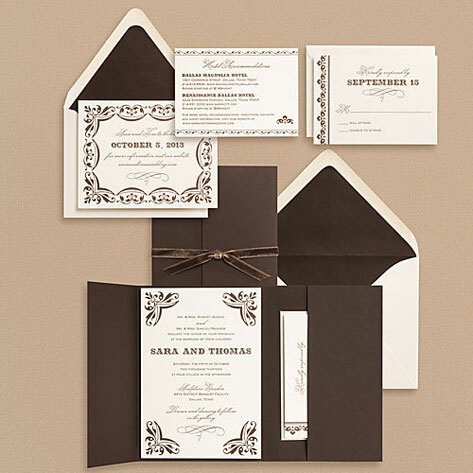 This festive Carnival wedding invitation suite features a combination of chocolate brown ink and accents and creamy ivory paper, and it's sure to make your guests feel in a celebratory spirit. Decorative flourish and pattern elements carry throughout the suite, adding elegance and visual interest, and the tri-fold pocket enclosures, tied with elegant velvet ribbon, holds your response card and additional wedding extras. Available flat printed or letterpress printed.